Everyday new people are discovering the fun and nutritional benefits of making your own Ice Pops at home. Some people enjoy making them so they can control the ingredient contents, some make them to save money and others make them just for the pure enjoyment of it. 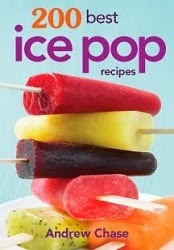 Whatever your reason, you will love this new 200 Best Ice Pop Recipes Cookbook by author Andrew Chase. Synopsis: You'll learn everything you need to know about making pops at home, including advice on choosing ingredients, freezing instructions and foolproof unmolding tips. Why buy commercial ice pops when you can be indulging in sumptuous pops made from home. These tantalizing favorites are perfect for everything from cooling off on summer days to capping off a barbecue to providing an afternoon snack for the kids. The frozen treats are made even cooler with innovative flavor combinations inspired by countries around the world, from Asia to Mexico and the Caribbean. My Thoughts: I love this cookbook! We have been making our own Ice Pops for many years! I started making my own about 25 years ago as I was fed up with grocery store prices and I didn't like all of the artificial ingredients found in commercial bought Ice Pops. 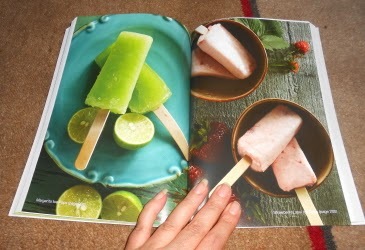 The first recipe we tried from this fabulous book was the Traditional Kulfi Ice Pops which were delicious! You only need 7 ingredients to make them and wow...they taste incredible! I love that the author has such a large variety of recipes in this cookbook, there is definitely something for everyone and to please all kinds of different taste buds. Some of the recipes are super easy and others take a little more time & ingredients but they are worth it! I also appreciate that every recipe comes with a few tips to help make your preparation and/or serving easier. Over the next few weeks I am really looking forward to trying out as many of these different ice pop recipes that we can. I think many of them have unique flavor combinations so they are perfect for adults and older kids. Then you have several classic flavors/combinations which are perfect for the younger kids who at times can be picky eaters. I really LOVE this cookbook & happy that I now have it for my cookbook collection. Head on over to Robert Rose and take a look at all of the great cookbooks that they have to offer.